A good VC is hard to find. Researchers studying the sector have noted that most venture capital funds “fail to generate attractive returns (or any returns) for investors.” Over the last several years, a number of well-known leaders in the industry, like Fred Wilson, have also spoken publicly about the mediocre returns that many venture firms deliver. On the other hand, the best VCs can be truly spectacular, both for their investors and the entrepreneurs with whom they partner. Jim Goetz, a partner at Sequoia Capital, invested close to $60 million in WhatsApp over several rounds starting in 2011. The value of this investment increased by approximately 50 times, when Goetz helped the company’s founders sell the firm to Facebook for $19 billion last year. Successes like WhatsApp don’t happen every day in the venture capital industry, but their impact is felt across the world. Data suggests that since 1979, more than 40 percent of new publicly listed U.S. companies were backed by venture capital. There is clearly a huge difference between the large number of underperforming VCs and partners like Goetz, but the reasons for this aren’t necessarily obvious. As a group, the general partners who manage venture firms seem quite similar: overwhelmingly male, predominately white and mostly middle-aged. However, when our team studied the partners at high-performing VC firms, something interesting stood out: It turns out that the secret of the best investors might be found in their pasts. Earlier this year, our analysts identified a group of 30 top-tier VC firms using a combination of industry rankings from sources like PrivCo and InvestorRank. These lists included many of the “usual suspects,” like Sequoia, Kleiner Perkins, Benchmark Capital and Andreessen Horowitz. Although it is not possible to know if these firms outperform all of their competitors, it is safe to assume that they are significantly better than the average venture firm. The best VCs can be truly spectacular, both for their investors and the entrepreneurs with whom they partner. We compared the partners who lead these top-tier firms with the partners of a randomly selected sample of 30 other venture firms drawn from the National Venture Capital Association’s member list. The differences in the backgrounds of these two groups was quite intriguing. 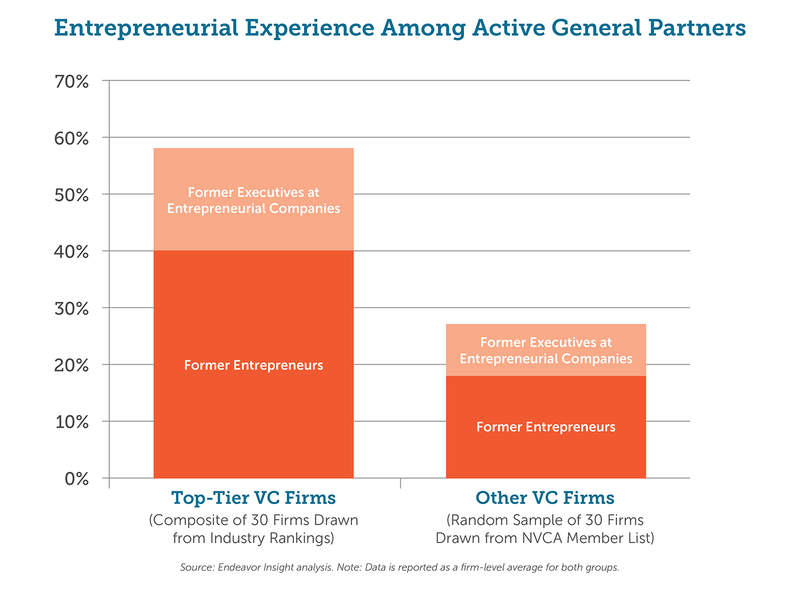 As the chart below illustrates, general partners at top-tier VC firms often have experience as founders or senior executives at entrepreneurial companies. On average, 40 percent of the current partners at these high-performing firms are experienced entrepreneurs, and almost one-fifth of them are former C-level executives at startups. The data for the randomly selected venture firms tells a different story. On average, only 27 percent of the partners at these firms had experience working as founders or senior executives at entrepreneurial companies. If we go further back in time and analyze the founding partners of these venture firms, the differences are even greater. Sixty-three percent of the original partners at top-tier venture firms came from entrepreneurial backgrounds — and more than half of these partners had personally launched startups. Within the group of randomly selected venture firms, less than 20 percent of the founding partners had experience as entrepreneurs or senior executives at entrepreneurial companies. While it is obviously possible to find exceptional investors without entrepreneurial backgrounds, this experience was remarkably consistent across the top-performing firms we studied. In fact, all of the top firms had at least one or two current partners with leadership experience in an entrepreneurial company. Among our randomly selected group, more than one-third of the firms had no partners with this experience. One additional note: You may be wondering about the backgrounds of the partners in our sample of non-top-tier firms. If they didn’t lead entrepreneurial companies before becoming venture investors, what did they do instead? The most common career background among the partners at the non-top-tier VC firms was banking. So what is it about entrepreneurial experience that seems to prepare people to become top-tier VC investors? It is likely a combination of three things. The first is knowledge. Investors who have worked as founders and C-level executives have an inside perspective on what it takes to make a company scale and succeed. This expertise is difficult to replicate in any other way. The second factor is the personal network that comes from working inside an entrepreneurial company. Investors can look to past colleagues at their former companies to help source investments and make useful connections for the entrepreneurs in their portfolios. Finally, there is probably an attraction factor at work, as well. Some founders are likely to prefer to partner with an investor who has been on a similar journey. During the last two decades, Endeavor has supported more than 1,000 founders in 24 countries. Many of these nations do not have strong venture capital industries, which makes it harder for local entrepreneurs to build fast-growing companies. When we reviewed the backgrounds of VC partners in this study, we noticed that many, if not most, of the top-tier venture investors with entrepreneurial experience had led companies that were very successful, typically exiting via a major acquisition or IPO. This mirrors something we’ve seen among the best founders in our network of more than 1,000 entrepreneurs in 24 countries. In Buenos Aires, two Endeavor founders from MercadoLibre, a multi-billion dollar, NASDAQ-listed e-commerce company, started KaszeK Ventures in 2011. KaszeK began investing from a $95 million fund, and closed a second $135 million fund last year. Another example can be seen in Beirut, where Hervé Cuviliez, an Endeavor entrepreneur who launched and sold a digital media company called Diwanee, started Leap Ventures earlier this year with local three partners. Leap has raised a $71 million fund to invest across the Middle East and North Africa. Our team at Endeavor now actively encourages the successful founders in our network to become venture investors in their communities. While it is clear that more research is needed in this area, we believe that fostering more of these uniquely experienced investors is one of the best ways to bring smart money into the local entrepreneurship ecosystems in which we operate — and ultimately help more entrepreneurs succeed. The full list of top-tier VC firms identified for this analysis can be found here. Special thanks to Fernando Fabre, who helped inspire this analysis, and to Neva Unsal, who assisted with this research project last summer.